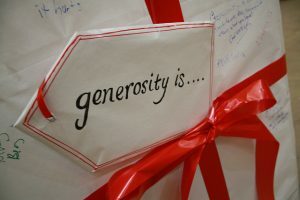 As someone who has spent a good portion of her adult life working in various non-profit and faith-based settings, I have been witness to some amazing acts of generosity and sacrificial giving. 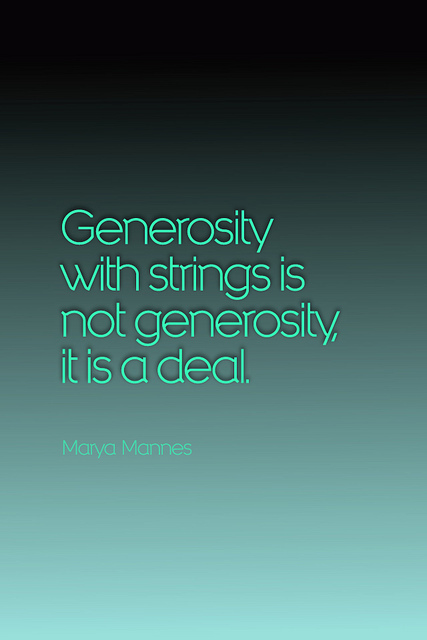 Yet, more often than not, I have seen generosity come with expectations and strings firmly attached. It’s not so much that people do not want to do good or make positive changes possible, it’s more that donors desire a level of control in the process. Whether this control comes in the form of a “naming opportunity” or a donor’s restrictions on how a gift may be used, the point is that the gift becomes less of a, well, gift and more of a transaction. I see this most often when a contributor expresses willingness to give as long as dollars do not go to support certain programs or projects. It might be giving to the local congregation but not to the judicatory body for mission support because of denominational stances or decisions, or it might be withholding congregational support until a certain pastor is gone or until the giver gets his or her way on some leadership decision. These are gifts that come with big “buts” attached and the scent of the donor’s desires all around. The problem is partly related to our North American culture of individuality and customization. We are much less focused on the good of the whole and more in tune to gratification of self. We’ve been taught–oh so carefully taught–through myriad consumer messages that we need to look out for our own self-interests first. Before we can give to others, we must be responsible for our own well-being; there has to be enough for us first before we can turn outward. I find myself sometimes conflicted over these messages. Yes, it is good to be responsible and careful, to be a good steward of one’s resources, but where is the limit? When does one cross the line from responsibility to selfishness and hoarding? I’m learning a lot from sisters and brothers in Tanzania, where the concept of stewardship and money management looks far different from that of my privileged North American culture. If there is a need, that immediate need is met somehow, some way. Even if it means someone sacrifices funds they were collecting for another purpose–such as rent–a more pressing need of a family member, friend, or neighbor takes precedence. There is a sense of trust that in meeting the present need future needs will also be met. If something needs to be done, one simply does it in good faith. In a world where scarcity of resources is very real, the culture is one of abundance. Here in North America, where abundance of resources is very real, the culture is one of scarcity. Funny, isn’t it? When I hear the words of Jesus in this Sunday’s parable, I am reminded of the problem we have with generosity. We want to control it, to manage it, and to conform it to our vision of what and who is worthy of it. God’s generosity doesn’t work that way at all. God is lavish with all of creation. Even the last and the least are worthy of God’s love and saving grace, of care and concern, and of a place at the bounteous table of blessing. 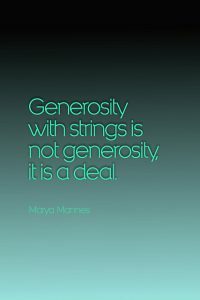 So yes, dear friends, by all means be generous. Be prodigal with your abundance and meager with your needs and wants. Think less; do more. It’s all about the “landowner” and not about the value or the pecking-order of the “laborers.” Everything belongs to God. Even we, who fancy ourselves to be the masters of our own destiny, belong to the generous Creator of the cosmos. What if you invited people to consider the connection between money and power in our contemporary context. Have them share with one another examples of how they have seen people use their gifts and generosity to attempt to control of influence outcomes. What has been the result? Has it helped? Has it hurt? Who does it hurt? The giver or the potential recipient? Consider rewriting the confession and forgiveness to reflect our human brokenness and attempts to control and exert power over others through our purported generosity. Then, rewrite the sending to send people forth into the world to be lavishly and blindly generous, to give without expectation of return or reward, and to love others with the generous love of God. Consider sharing Flannery O’Connor’s short story “Revelation” with your youth group. Invite them to consider what the story has to say about our assumptions of who is worthy and who is deserving. How does this story compare with the parable in today’s gospel lesson? O’Connor’s story is set in the rural south. What might the players look like if they were lifted out of your particular context and time? Does human nature really vary that much? Invite the children to play “Reverse Musical Chairs.” Most youngsters will be familiar with the classic game where you start out with one less chair than participants, and keep eliminating chairs and participants until there is one “winner.” In reverse musical chairs, you keep adding a chair until everyone has a place to sit. The object is to play until everyone has a spot–even the very last person left standing eventually gets a place to sit. The children may think this game is silly. What’s the point if no one gets eliminated? Where’s the competition? Does everyone really win? These same sorts of questions must have been running through the minds of the laborers when those who come to work later in the day get the same amount of pay. Where’s the fairness in that? Of course, the point is that with God there’s always enough for everyone to have some. Everyone gets a chair–a place–at God’s table. 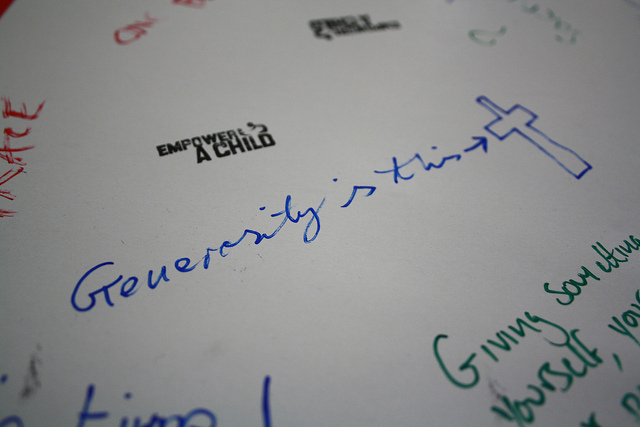 Photos: Stewardship–Transforming Generosity and Brett Jordan, Creative Commons. Thanks!